The cover of this issue of The Corvette features a detail from a double-hemispherical map of the world printed in Amsterdam in the eighteenth-century for inclusion in a bible. 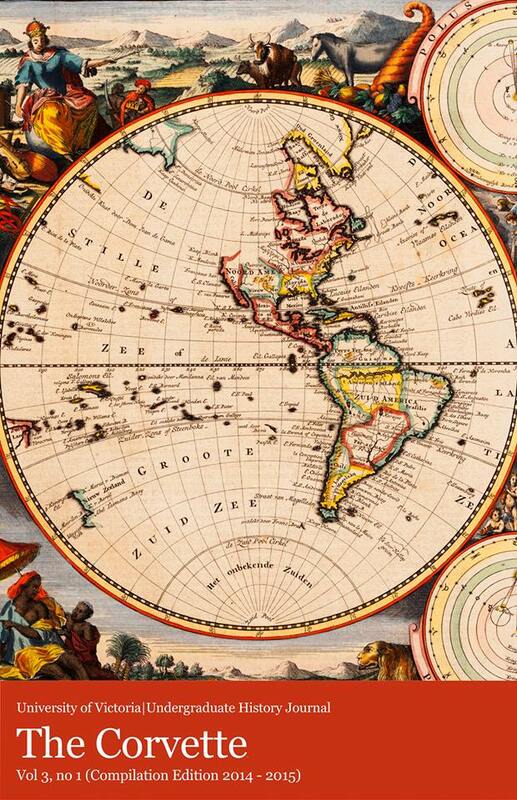 Each corner of the map features allegorical figures intended to symbolize four continents; seen in detail here is Europe (top-left), with the other corners featuring Asia (top-right), North and South America (bottom-right), and Africa (bottom-left). The map and the allegorical representations derive from a seventeenth-century Dutch bible map produced by Nicolaas J. Visscher (1618-1679) in Amsterdam in 1663. Notably there are several regions that are incomplete (including North America, Australia, and New Zealand) reflecting seventeenth-century geographical knowledge. The signature of Jan Van Jagen (c. 1710-1796), a Dutch engraver, and son of the engraver Cornelius Van Jagen (fl. 1706-1744), can be found at the bottom-centre. The map was printed in black and white and hand painted with watercolour. For this reason the copy held in Special Collections is unique when compared to other known copies of the map, such as a copy held at the National Library of Australia, which has significantly different watercolour work. The verso of the map contains the following chapter, titled in Dutch: “Short description of the landscapes of the world, how it has been divided by the flood and inhabited by the offspring of Noah; serving further explanation for the tenth Cap. of Genesis.” Bruce and Dorothy Brown donated the map to Special Collections in 1993. Special Collections and University Archives serve as a research and teaching resource for students, faculty, and the community at large. Its mandate is to collect, preserve, and make accessible rare books, manuscripts, maps, architectural plans, photographs, and oral history interviews, among many other documents. Rodney W. Shirley, “431 Nicolaas J. Visscher,” The Mapping of the World: Early Printed World Maps, 1472-1700. (Riverside, Conn.: Early World Press, 2001) 451. R. V. Tooley, A Dictionary of Mapmakers. Map Collectors’ Series. Volume 8, No. 78 (London: Map Collectors' Circle, 1971) 270. Van Jagen, Jan, [World] ( s.n, [Amsterdam], 1710), National Library of Australia (Call Number: 399638; MAP RM 2815), http://trove.nla.gov.au/version/7169798. My thanks to Dr. Kirsten Sadeghi-Yekta, Assistant Professor, Applied Theatre, University of Victoria, for her translation from Dutch into English.